10 Reasons Why You Should Hire an Interior Designer for Your Home Reno Project — Jostar Interiors Ltd.
Do you feel like interior designers are overrated and that you can handle the full renovation of your home yourself? 1. We're with you every step of the way. Don't know where to start? Not sure if you understand all the reno-lingo? Hesitant about where to spend your money? The simple solution is to hire a designer. Designers will handle the planning, drawings, product selections and finishes, contractor hiring, and any other problems that might occur. 2. We're trained and highly experienced. Design is our livelihood. That means we take a huge interest in the industry and genuinely want to help as many people improve their homes as possible. Not only did we go through professional schooling to learn the best industry practices, we have been working on the job every day for years. We are literally trained to see things others can't even visualize. We are your second eyes. 3. We know what is best suited for your home. These images show what can happen when a designer is not involved in the renovation process of a home. One of our clients hired a contractor without finding out what his level of workmanship was. With no communication and lack of knowledge on installation or product specifications, the flooring that was installed started cracking 2 years after being installed. Conversely, if a designer had been involved, the most appropriate flooring for the space would've been chosen, problems would've been communicated effectively, and most importantly, an experienced contractor would have been hired for the job. 4. We save you money in the long run. This kitchen is a prime example of why using an interior designer can save you money in the long run. In an attempt to cut costs early on, the owners of this home took some shortcuts. The dishwasher right next to the sink made it harder to load. The corner cabinet against the wall, which was not installed properly, can barely open 3 inches. A designer has the knowledge to plan and design a whole layout so it's functional, saving money in the long run. 5. We give professional assessments. Correctly assessing a space is key to having a successful renovation. A designer will know just what to look for in each nook and cranny of your home. We will assess your whole project from top to bottom, making sure that everything is taken care of. Like the poor installation of this 2-year old floor, designers will suggest and point out the key elements that we think will be crucial into the making of your new home. 6. We give visual representations. Most people have a hard time visualizing what their space will look like, or has the potential to look like after a renovation. Whether it is a colour change, having a wall removed, or even just furniture re-arrangement, we have the technology to help you best. Interior designers have the tools to create 3D drawings in full colour to help clients accurately visualize their space and ease the stress of renovation. Reworking your home is a large undertaking; you want to love the space that you will be in. 7. We have a wide range of reliable resources. 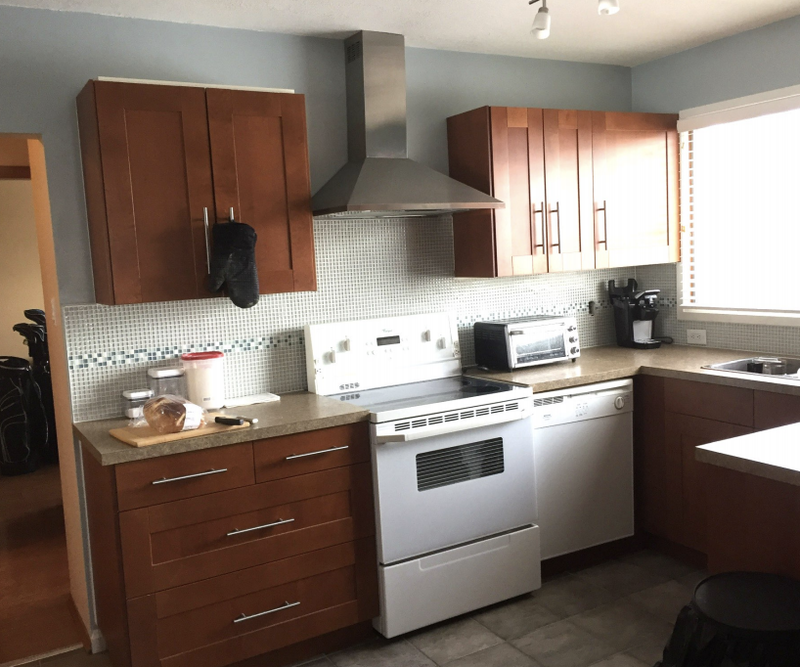 A short trip to Rona, Canadian Tire, or Home Depot will quickly show you the wide range of products you can choose from when working on a home project. However, this is often more overwhelming than helpful. A designer not only knows about products you might never have heard about, but also has a solid background of what should and shouldn't be going into your home. Instead of jumping from store to store to try and find your dream material, let a designer go straight to the source and pick it out for you. 8. We work with plans and make budgets. Let's face it. Making budgets and sticking to a plan is hard enough in our personal day to day finances, let alone with a major project like a home renovation. Giving an interior designer a rough idea of what you want to spend will allow them to find good products within your budget, choose the right finishes, minimize any room for error, and hire the best external contractors that you can afford. 9. We guarantee the re-sale value of your home. Hiring an interior designer to help with the renovation of your home will guarantee you a higher resale value when you decide to sell. Don't opt for an easy fix that is bound to fall apart after a year or two. Do it right the first time. 10. We actually like to communicate. There have been times when hiring a contractor creates more problems by not communicating important issues that arise during the project . Sometimes this occurs because a contractor is not experienced enough to recognize an issue when they see one. Other times, it happens because they feel speaking up might complicate the job or extend the amount of time it takes to complete. As designers, we have been trained to recognize design flaws and effectively communicate them to our client. We want to make sure that you receive the best possible version of the vision in your head. Hopefully these reasons have given you some food for thought! If you'd like to find out how much it'll cost to hire a professional designer to make your dreams come true, check out the price guide below!